SanDisk Launches 512GB SD Card - Highest Capacity Memory Card Ever Made. The card, which is the size of a postage stamp, will go on sale for $800 (£490). The launch comes a decade after the firm released a 512-megabyte (MB) SD card with one-thousandth of the space. Experts believe SD cards could eventually hold up to 2 terabytes (TB) of data, about 2,000GB. The new card is aimed at film-makers shooting in the high-quality 4K format. The 4K format - which is four times the resolution of HD - requires large file storage. Depending on compression, a single minute of 4K shooting will typically take around 5GB of storage space. 4K Ultra HD is an example of a technology that is pushing us to develop new storage solutions capable of handling massive file sizes. 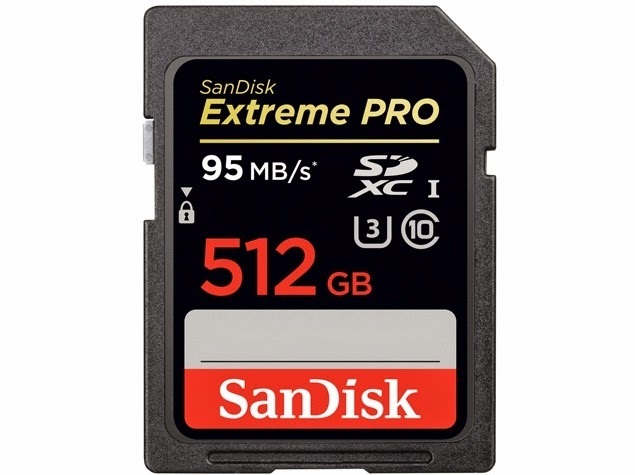 The SD card format is one of the most widely used standards of flash storage, popular with digital cameras, camcorders and other mobile devices. While camera types, resolutions and settings vary - a 512GB card could potentially hold around 30 hours of HD video.